Philips has released details about its latest series of LED-equipped TVs – the 9704 range. This is the first time the company has unveiled its LED Pro technology, which increases the amount of LEDs used by a whopping 75 per cent. This means that there are now 224 LED segments on the panel, with each segment having the ability to be independently dimmed or brightened. As well as some new LED tech, the 9704 range boasts an amazing 5,000,000: 1 dynamic contrast ratio and the fastest response time ever on an LCD TV – 1ms. 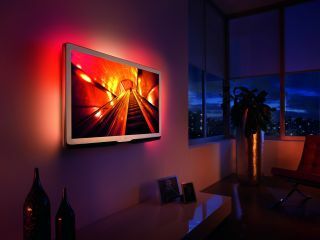 Top this off with 200Hz technology, three-way Ambilight control and the fact that it uses 50 per cent less power, and what you have is a TV to be reckoned with. Philips has also made the 9704 range compatible with the company's online NetTV services which turns your TV into a web hub, and to add to its web capabilities the television comes brandishing DNLA certified Wi-Fi. On-board connectivity comes in the form of five HDMI sockets and sound is piped through a 2x15W output into four speakers. The 40PFL9704 (40 inch) and 46PFL9704 (46 inch) have a release date of December with an estimated selling price of £1,799 and £2,499 respectively. Go to www.philips.co.uk for more details.